This piece was evidently given to subscribers by newspaper boys as a token of thanks from the Birmingham, Alabama newspaper. 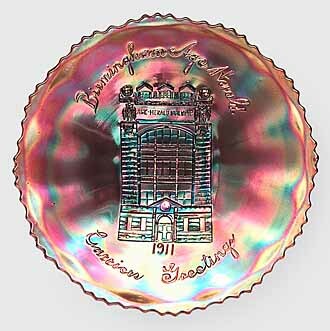 The phrase at the bottom reads, “Carriers Greetings.” Ruffled bowls like that on the left are more scarce than the plates. 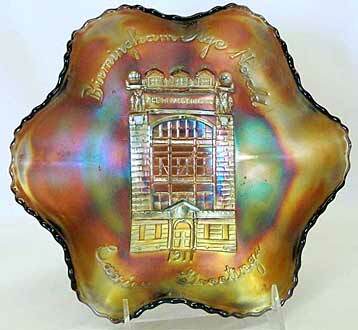 This ruffled example sold for $1,050 at the 2012 Heart of American Carnival Glass auction. Photo courtesy of Seeck Auctions.